But what’s the best way to get around yourself? I think I may have found it. In between shows and events I like going around town to see what cars are out or have been left in front of a restaurant for lunch. For one week a year, the streets of Carmel and Monterey become a moving motor show. It’s not unusual to find hidden gems like a Slate Blue Lexus LFA or a Ferrari 250 Lusso parked up in a back road somewhere. However, there comes a point when one becomes jaded from all the exotics. (A good problem to have, I know.) If there’s ever a time and place where there’s an over saturation of supercars and sports cars it’s here. For many visiting from faraway lands, getting a sporty car to use for the week to “blend in” seemed to be the norm. But if you want to stand out, what you need was a right hand drive ’80s kei truck. For Car Week 2018 I had the pleasure of adopting an imported 1989 Honda Acty thanks to a fellow named Clark Sopper. He uses this truck for various purposes from hauling garden supplies, driving around his neighborhood, and as a promotional vehicle for his design studio, Highball. They’ve done some cool projects worth checking out on their website. For Car Week, the Acty served as my companion to find some of the coolest cars on the streets of Monterey. Coincidentally, “highball” is also a type of mixed drink in Japan. The Acty was the perfect vehicle for this purpose. Powered by a 34 horsepower 547cc three-cylinder engine, it was ideal for zipping around town. Sure, it was a far cry from all the McLarens, Lambos, and Ferraris but at least it was a manual, five-speed no less. Because of its small size finding parking for it was easy too. Oh, and it had visibility that’d make most crossovers today jealous. But that great visibility was also a double-edged sword because while I could see everything, everyone could also see me. This cute little truck got attention everywhere it went and in town people would cheer or ask questions about it while I was in traffic. The most common one was if it was actually road legal and how much something like this cost. It attracted so much attention when the Team Gelag Batmobile—a replica of the car in the Arkham Knight video games—rolled up to Car Week it was only natural we had setup a photoshoot with these very different vehicles. 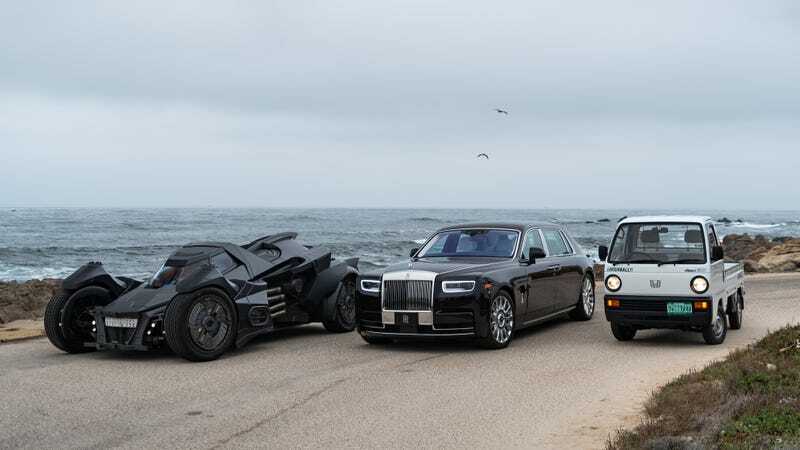 The Batmobile shoot on 17 Mile Drive resulted in my favorite photo from Car Week this year when a random Rolls Royce Phantom joined the party. He was just driving by when he saw these two parked on the side and came in for a closer inspection. It ended up making the perfect Batman, Alfred, and Robin combo. This thing just oozes charm. Talking to random people about this truck brought back memories of quirky cars they’ve had in the past. One guy reminisced about his first car, a right-hand drive Subaru, and another had a micro-car memory from his school days where they’d moved a neighbor’s bubble car from its parking spot. I had never understood the charm and appeal of these things until now. In Japan they’re used primarily for utilitarian purposes. The idea of a kei truck, or keitora, for recreational purposes seemed foreign to me. They came out of a need post-war to help grow small businesses and farms. But Clark and a handful of others in America have realized the appeal of these trucks. I liked the way Clark compared these trucks to a cat; they way they sit, the rumbling purr, and the way they scoot around neighborhoods, brightening people’s day. Clark attributes the growing popularity of keitoras in America to a number of reasons. The first is the 25-Year Rule which makes these easy to import and register the newer kei trucks in America. These more modern trucks, Clark says, are better suited to driving on American roads which are smoother, quieter, and a bit quicker than older trucks. The second reason is these are an affordable entry into classic ownership while still offering something “exotic” and unique. Which ties in with the third reason for standing out and differentiating from the crowd: it’s something that appeals to younger collectors. Certainly, while I was out on my hunt for the coolest cars around town the humble little Honda stole some of spotlight away from the exotics. In a week where it’s completely normal to see a random Lamborghini Reventon at a shopping center, a couple of classic Mercedes SLs parked in front of a house, and a Ferrari Enzo driving around, the little Acty had its moments too. Admittedly, it’s not a vehicle you’d use to chase cars around so it was lucky most of the exotics at Car Week were driving around town or parked up. It’s not a particularly difficult thing to drive, all the controls were easy to use. The clutch and gear changes needed some getting used to a first but once I was comfortable, it was just like driving any other manual car. The steering was a tad heavy, but hey, it had character. Getting on the freeway between Carmel and Monterey was always a daunting task. I’ve driven kei cars before, albeit modern ones, and you really have to be on the accelerator all the time to get any power. For reference, most modern kei cars have about 64 HP. Getting the Acty up to speed was the tricky part, but once you get it to about 50 or 60 mph it was manageable. Under heavy acceleration the three-cylinder engine almost sounded like a much sportier car. Some were reminded of 911s, others thought of the S2000. I wouldn’t want to go much faster than 60 mph in this. Amazingly, most motorists were quite understanding giving me plenty of space. Or perhaps they were worried I’d topple over. Last year I got around in a friend’s BMW M4 and a Jaguar F-Type SVR, and as fun as those were, the Acty was a whole other sort of fun. I had never imagined I’d be hunting for exotics in America in a right-hand drive kei truck but I’m glad I did. It’ll go down as one of my favorite moments of 2018. As well as the six keitoras in his collection, including the mint green TN360 displayed at The Quail, Clark also has several project vehicles he’s designing for customers. He says his broad collection allows him to experience kei trucks from all eras. His Highball studio are currently working on ways to combine their experience with electric vehicles, adventure, and mobility with these trucks. An electric-conversion on an 80s kei truck could just be the perfect urban vehicle, or at the very least the perfect Car Week 2019 vehicle. Car Week is only as fun as the people you’re with, and this year was a lot of fun. A special thanks again to Clark for letting me use the Acty for the week.